Last week, we revealed our January Grant finalists. After much deliberation, we’re thrilled to announce the recipient — Otehlia Cassidy, Founder of Madison Eats Food Tours. WN: What drove you to create Madison Eats Food Tours? OC: I have always felt driven and inspired by connecting with people, especially people of diverse backgrounds. Ever since I was a kid I wanted to explore the world. I have been fortunate to travel all over the world, including places that many tourists don’t go and where I couldn’t speak the language – indigenous villages in the rainforest of Guyana, remote villages in Mali, West Africa or even towns in South America or Europe. Even if you don’t speak the same language or have the same beliefs, you can share a meal. Eating and cooking are universal and offer a place for joy and conversation, appreciation and connection to each other. I wanted to build those relationships at home. 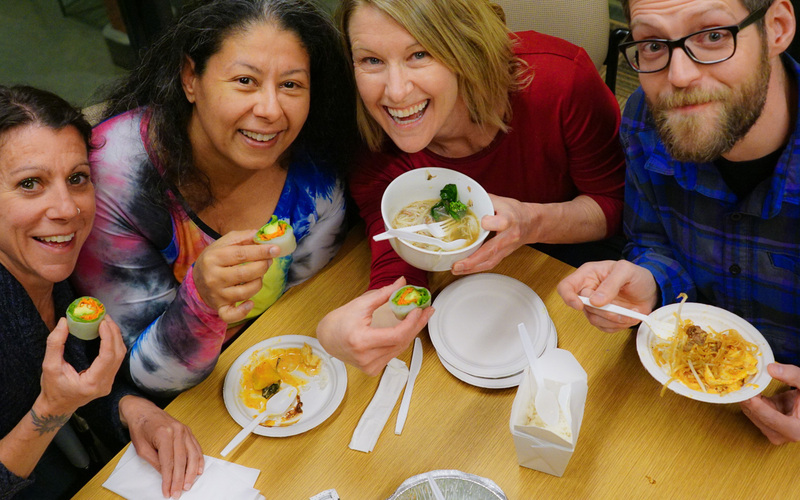 I wanted to learn about the people in my community and to bring people together around food — who doesn’t love to eat?! Even here in Madison, where I have lived for 20 years, starting a food tour company has allowed me to develop meaningful connections within my community, and support our local economy — all while eating delicious food. It’s a great job! WN: Some people might be unaware of all of the culinary offerings within Madison. Give us a sample of what one might experience in your city. OC: Madison has been underrated as a food city for some time, but that is rapidly changing. We have a network of incredible chefs, including Tory Miller, who won the Iron Chef Showdown against Bobby Flay. Madison is also home to a diversity of food producers — we are home to the largest producer-only farmers’ market in the country. Chefs have immigrated here from all over the world, including a large number from Thailand and Laos. What this means is that our food scene is very diverse with quality ingredients and people who truly care about food. We boast a top notch farm to table scene, and also family run restaurants such as Lao Lan Xang, a restaurant owned by Bounyang Inthachith, who immigrated here from Laos almost 30 years ago. She fled Laos with her 4 children after the Vietnam war. After arriving in snowy Wisconsin, speaking no English, she says that her youngest son cried for rice. She started cooking for him and soon was cooking for other people. Now her restaurant is one of the most popular in Madison. She in turn supports Hmong farmers, who fled the same war. On our food tours we visit these restaurants and learn about the stories of the chefs and owners, forging connections and exploring our community while enjoying a great meal! WN: How have you marketed the business? What avenues have been most successful? OC: I have been uncertain about the best marketing strategy. Honestly, that is my weakness. This year I am working with professionals to help work on SEO and developing ad campaigns on different platforms. I plan to put more effort and money into marketing this year as I plan to grow the company. Much of my marketing has been Facebook, Instagram, and my website, as well as word of mouth and Trip Advisor, where we are rated the #1 food tour in Madison! Other people vouching for your product is the best advertising. OC: As I mentioned, marketing has always been daunting to me. I plan to use the money to market more strategically. I will direct market to companies. I have already met with a web designer to make my site mobile friendly and to help develop ads for social media. I also want to grow what I offer and continue to directly support the diverse food producers in our community through developing new tours such as a farmers’ market tour, and tours that directly support minority populations, such as Black and Latino owned business, women and LGBT owned businesses. OC: I have a few mantras that I rotate through my day. As women, we have to believe that we are worthy. You are worthy! It’s easier to be fearful and sit in our safe space that to risk failure or uncertainty, but take the risk, because all you have to lose is you. I firmly believe in a vision board/daily affirmations where the thoughts and wording are key. Rather than saying “I want” or “I will” say it as if it is happening already. “I own a successful food tour company and sell over 3000 tickets a year.” Your words are powerful. And so are you.